A slew of NCAA Division II cross country teams were in action this past weekend, but for the most part, the status quo went unscathed. 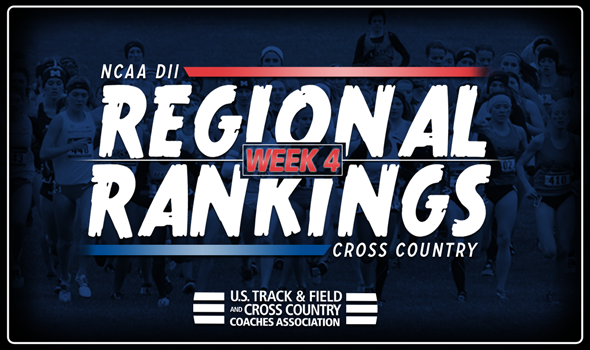 The fourth week of the U.S. Track & Field and Cross Country Coaches Association (USTFCCCA) NCAA Division II Cross Country Regional Rankings were announced on Tuesday, and it shows that the teams at the top of their regions went out and took care of business on the course. The men’s eight regions went relatively unchanged at the top, while the women’s eight regions saw one new team rise to first place. For the first time this season, Shippensburg’s women’s team do not reign supreme in the Atlantic Region. Edinboro supplanted the Raiders in the rankings this week after winning the non-NCAA Division I scored division of the Paul Short Run Brown race, while Shippensburg finished fifth. The rankings were flip flopped on the men’s side, with Shippensburg coming in first after a runner-up performance at the Paul Short Run. Indiana (Pa.) (men) and California (Pa.) (women) round out the respective top-threes. The men’s programs from Augustana (S.D. ), Missouri Southern and Central Missouri were all idle on the week, but remained 1-2-3 in the Central Region. However, Lindenwood gained some ground in the region, moving up six spots to fourth after placing third in the college division of the Chili Pepper Invite. The top-six women’s teams in the region held strong from last week, with Pittsburg State (first), U-Mary (second) and Augustana (S.D.) (fourth) all inactive. Oklahoma Baptist also stayed in third, but competed at the Chili Pepper Invite, where it came in third. Leakey Kipkosgei and American International are still in first place on the men’s side in the East Region after a strong showing at the Paul Short Run, where Kipkosgei finished fifth overall. Stonehill (second) was idle, while Adelphi (third) also took place at the aforementioned meet at Lehigh. On the women’s side, Stonehill (first) and Robert Wesleyan (third) were idle on the week, but managed to maintain their position in the rankings, despite solid showings from Assumption (second) and American International (fourth). Assumption finished second to Edinboro at the Paul Brown Run, while American International finished third in the Paul Short Run White race. The top-three teams in both the men’s and women’s rankings in the Midwest Region mimicked last week’s poll, but Walsh’s women continued its climb. After starting the season in ninth, the team moved to fifth two weeks ago before jumping to fourth on Tuesday after finishing third at the All Ohio Championship on the legs of Amanda Vincent (23:56.1 – first) and Macy Lynch (23:56.8 – second). Grand Valley State still owns a monopoly on top spots in the region after impressive races at the Cross Country Classic. Hillsdale and Southern Indiana rounded out the top-three on the women’s side, while Southern Indiana and Lewis placed second and third, respectively, once again in the men’s rankings. There were no surprises here, as Lee (Tenn.) managed to lock down the top billing in the South Region on the men’s and women’s side again. The women’s squad took home the team title at the Royals XC Challenge thanks to a third-place finish by Hannah Wolkenhauer (17:11), while the men’s team were runners-up. Alabama-Huntsville (second) moved up one spot while Saint Leo (third) jumped three spots in the men’s rankings after both teams were solid at the Royals XC Challenge. Saint Leo’s women’s team placed third at the same meet to maintain its second-place ranking, while Alabama-Huntsville rounded out the top-three. The women’s program at Colorado Mines made a nice little push into third place in the South Central Region this week after beating Dallas Baptist by 31 points at the Chile Pepper Festival, returning to where they were ranked to open the season. Adams State’s men and women are still in the lead in the region. Colorado Mines’ men’s team came in second once again after winning the Chile Pepper Festival with Matthew Kade (30:20.5 – second) and Ricardo Ocampo (30:27.6 – third) finishing in the top-three. Western State’s women were idle, yet remained in second, while CSU-Pueblo’s men ranked third again after winning the Rocky Mountain Shootout. North Georgia’s women’s team and Lenoir-Rhyne’s men’s squad were the only teams to make any noise in the top-10 of the Southeast Region. North Georgia moved up one spot to third, despite being idle, while Lenoir-Rhyne jumped into the top-10 after a sixth-place finish at the Royals XC Challenge. Mount Olive, Queens (N.C.) and Augusta went 1-2-3 on the men’s side once again, while Queens (N.C.) and Mount Olive were first and second, respectively, in the women’s rankings. Winning the Capital Cross Challenge against a slew of NCAA Division I talent helped Chico State’s men’s program remain in first in the West Region. Cal Poly Pomona finished second in the same race to keep them in their rightful spot of second in the region. Simon Fraser and Cal Baptist were first and second, respectively, in the women’s rankings after an idle weekend, while Cal State San Marcos stayed in third after an impressive showing at the Mustang Challenge. Cal Baptist’s men’s team rounded out the top-three after an inactive weekend.